One example of the increasing fear of armed blacks is the 1834 change to the Tennessee Constitution, where Article XI, 26 of the 1796 Tennessee Constitution was revised from: "That the freemen of this State have a right to keep and to bear arms for their common defence," to: "That the free white men of this State have a right to keep and to bear arms for their common defence." [emphasis added] It is not clear what motivated this change, other than Turner's bloody insurrection. The year before, the Tennessee Supreme Court had recognized the right to bear arms as an individual guarantee, but there is nothing in that decision that touches on the subject of race. Elijah Newsom, "a free person of color," was indicted in Cumberland County in June of 1843 for carrying a shotgun without a license -- at the very time the North Carolina Supreme Court was deciding Huntly. Newsom was convicted by a jury; but the trial judge directed a not guilty verdict, and the state appealed to the North Carolina Supreme Court. Newsom's attorney argued that the statute requiring free blacks to obtain a license to "keep and bear arms" was in violation of both the Second Amendment to the U. S. Constitution, and the North Carolina Constitution's similar guarantee of a right to keep and bear arms. The North Carolina Supreme Court refused to accept that the Second Amendment was a limitation on state laws, but had to deal with the problem of the state constitutional guarantees, which had been used in the Huntly decision, the year before. The North Carolina Supreme Court also sought to repudiate the idea that free blacks were protected by the North Carolina Constitution's Bill of Rights by pointing out that the Constitution excluded free blacks from voting, and therefore free blacks were not citizens. Unlike a number of other state constitutions with right to keep and bear arms provisions that limited this right only to citizens, Article 17 guaranteed this right to the people -- and try as hard as they might, it was difficult to argue that a "free person of color," in the words of the Court, was not one of "the people." The decision Cooper and Worsham v. Savannah (1848) was not, principally, a right to keep and bear arms case. In 1839, the city of Savannah, Georgia, in an admitted effort "to prevent the increase of free persons of color in our city," had established a $100 per year tax on free blacks moving into Savannah from other parts of Georgia. Samuel Cooper and Hamilton Worsham, two "free persons of color," were convicted of failing to pay the tax, and were jailed. On appeal, counsel for Cooper and Worsham argued that the ordinance establishing the tax was deficient in a number of technical areas; the assertion of most interest to us is, "In Georgia, free persons of color have constitutional rights..." Cooper and Worsham's counsel argued that these rights included writ of habeas corpus, right to own real estate, to be "subject to taxation," "[t]hey may sue and be sued," and cited a number of precedents under Georgia law in defense of their position. Justice Warner delivered the Court's opinion, most of which is irrelevant to the right to keep and bear arms, but one portion shows the fundamental relationship between citizenship, arms, and elections, and why gun control laws were an essential part of defining blacks as "non-citizens": "Free persons of color have never been recognized here as citizens; they are not entitled to bear arms, vote for members of the legislature, or to hold any civil office." The Georgia Supreme Court did agree that the ordinance jailing Cooper and Worsham for non-payment was illegal, and ordered their release, but the comments of the Court made it clear that their brave words in Nunn v. State (1846) about "the right of the people," really only meant white people. In Cockrum v. State (1859), the Texas Supreme Court had recognized that there was a right to carry defensive arms, and that this right was protected under both the Second Amendment, and section 13 of the Texas Bill of Rights. The outer limit of the state's authority (in this case, attempting to discourage the carrying of Bowie knives), was that it could provide an enhanced penalty for manslaughters committed with Bowie knives. Yet, by 1872, the Texas Supreme Court denied that there was any right to carry any weapon for self-defense under either the state or federal constitutions -- and made no attempt to explain or justify why the Cockrum decision was no longer valid. "The Ohio supreme court having decided that it is a crime to carry a concealed weapon on one's person in one's home, even in one's bed or bunk, this weapon is hung upon the wall that you may see it, and before you commit any burglary or assault, please, Mr. Burglar, hand me my gun." Today is not 1893, and when proponents of restrictive gun control insist that their motivations are color-blind, there is a possibility that they are telling the truth. Nonetheless, there are some rather interesting questions that should be asked today. The most obvious question is, "Why should a police chief or sheriff have any discretion in issuing a concealed handgun permit?" Here in California, even the state legislature's research arm--hardly a nest of pro-gunners--has admitted that the vast majority of permits to carry concealed handguns in California are issued to white males. Even if overt racism is not an issue, an official may simply have more empathy with an applicant of a similar cultural background, and consequently be more able to relate to the applicant's concerns. As my wife pointedly reminded a police official when we applied for concealed weapon permits, "If more police chiefs were women, a lot more women would get permits, and be able to defend themselves from rapists." In the seventeenth century, the aristocratic power structure of colonial Virginia found itself confronting a similar challenge from lower class whites. These poor whites resented how the men who controlled the government used that power to concentrate wealth into a small number of hands. 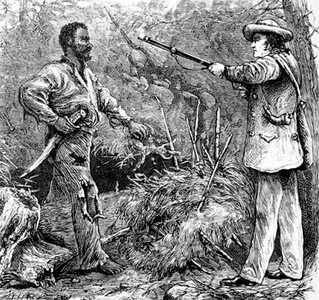 These wealthy feeders at the government trough would have disarmed poor whites if they could, but the threat of both Indian and pirate attack made this impractical; for all white men "were armed and had to be armed..." Instead, blacks, who had occupied a poorly defined status between indentured servant and slave, were reduced to hereditary chattel slavery, so that poor whites could be economically advantaged, without the upper class having to give up its privileges. Ocelot can't see the forest for the trees. The point is an unarmed population is much easier to oppress than an armed population. Our government for some time now has viewed the masses as cattle to be farmed. The second amendment stands in the way of our government becoming even more oppressive than they have over the last 10-years. If you have to kill the goose that lays the golden egg to keep it in its cage, the effort becomes counterproductive. Ocelot also seems to forget which party created and promoted Jim Crow laws back in the day and which party freed the slaves. Banning guns from law-abiding citizens is a critical achievement the Democrats need to accomplish to move to masses to a government owned plantation. No one is supporting the democrat party. In many other counties the working class have defended themselves from the state and capitalism far more effectively then in the US without having anything like the same level of gun ownership, so your argument makes no sense. I'd be interested in hearing about which revolutionary movements didn't involve armed self defense to some degree. I appreciate ocelot pointing out the author's political line and identity, although for me that does not change the history detailed here, and similarly, it's worth noting that in the civil rights era the racist right was a champion of gun control to keep southern blacks unarmed, while the left generally defended gun rights. And probably the more important point, is that civil rights organizers often did arm themselves in self defense against the Klan and their sympathizers in that day (and, perhaps as importantly, not against the state). About midway through this radio program, there is a decent accounting of this (besides other articles, most notably Deacons for Defense -- which I know there is some stuff on this site about). While a very brief rundown, it also demonstrates a little why guns and america are a very complicated mix of factors, and I think why you can't easily talk about "well, in other places..." w/regards to numbers of gun ownership, gun deaths, etc. That first piece in the "More like this" sidebar, Gun Rights are Civil Rights has a more expressly class struggle view on the issue, and also debunks the myth around the 2nd amendment that Le Droit seems to rep. The reality is far more complex, and racially loaded history, than what either proponents or opponents of gun control are usually willing to acknowledge or are themselves aware. Written in response to the Heller v DC Supreme Court ruling (2008) which has to an extent legally codified individual gun ownership here for the foreseeable future. ... the dispute between "liberal" gun control proponents and "conservative" gun rights advocates is a sustained disagreement about the relationship between armed whites and the government. Liberals trust the state to respect the rights of individuals and to protect them against crime and disorder; they see no role for gun ownership under the rule of law. Conservatives retain some suspicion of government regulation and don't believe the state capable of protecting decent law-abiding people; they see gun ownership both as an emblem of citizenship and as a protection against those they see as criminals -- historically, blacks, and at present, immigrants as well. The disagreement is over who should have guns; the point of agreement is over who shouldn't. As presently construed, both the gun control and the gun rights arguments -- that is, both the liberal and the conservative positions -- represent the defense of white supremacy. No, absolutely, the BTR piece does, imo, look at the inter-meshing of gun laws and racist politics in the US from a left-wing perspective. In a way that, again, imo, the above piece does not. In the above, the anti-racism as at best formalistic liberalism, and with the instrumental intent of the "punch-line" assertion at the end that today it is the "law abiding citizens" who are the new targets of gun control "racism". If we deconstruct this with the BTR's decoding (as in the quote you included) that effectively translates in to the age-old racist trope that "ordinary white folks" are now the "new blacks" or target of today's racism - more sinned against, than sinning. I wouldn't go as far as to definitely impute such cyncism to Cramer without any other evidence - he may well be sincere in his belief that he is opposed to racism - but it must be said, it's the kind of argument you definitely don't expect to see from a left and genuinely anti-racist writer. I actually think there is a more interesting piece to be written on access to guns in the US and the apparently disproportionately "white" nature of these murder-suicide mass killings (schools, malls, etc) compared to the much higher chance of being the victim of gun violence if you are African-American or other POC (I presume). But I certainly don't have the knowledge to write it. What I would say is that contrary to the NRA or pro-gun control liberals, the notion that access to guns is primarily mediated by law, rather than issues like money (many of these assaults involve an arsenal that costs more than a car - not accessible to people on food stamps) and race (despite my lack of knowledge, I still suspect that black males would find it hard to walk into a K-mart, gun store (not to mention gun fairs which look to be not exactly POC-friendly places, given the Confed flags, cops and nazis, etc,..) and pick up an AR-15, AK or TEC-9 with no questions asked, even if they had the money. It seems to me that access to guns for many black people in the US is contingent on joining the cops, the marines or a gang - all of which kind of rule out the isolated, asocial loner profile of these school/etc shooters. But I could be entirely wrong on that. What I would say is that a properly materialistic or class centred analysis would see access to guns (and most other things) as being socially mediated in which the role of the law is simply one determination amongst many. Very good points. And these are some of the very reasons why the assault weapons ban and strengthened criminal background checks being touted right now will do effectively very little if anything to curb these shootings. There are some technical issues around semi-autos, and the "grandfathering" of existing guns, which add to these reforms' ineffectiveness. That said, I'm not really a fan of the concealed carry laws (legal in 49 states currently) and much less the "stand your ground" ones, fitting as they so often do in the BtR quote's logic of white supremacy. I will say that you might be surprised, ocelot, as to how relatively common some manner of gun ownership is, even if a light caliber, or more simple revolver or pump shotgun, across a fairly broad swathe of people, poor, liberal, progressive left and people of color. I have a lot of issues with gun culture here, but it's a misconception had by many (including in the US) that it is solely the provenance of the rightist, reactionary, white male population -- even if this grouping takes up an obnoxious and vocal amount of space in it. As far as who has brand new AR-15s or semi-auto pistols, your points are more or less correct (although again, it's not an across-the-board thing, either). I have been thinking similarly, that a class/left-libertarian perspective is very much needed on this issue here in the US. do places that sell guns need to get permission from the local government and cops? Depends on what you mean by places. Gun dealers are required to have a Federal Firearms License (FFL), but private, individual sellers can sell "long guns" as long as those guns do not violate local or state laws. Handgun sales require a certified background check, as far as I know, although this may be a state-level thing. I imagine there are limits on how much profit you can take before you need to have the FFL, but I don't know that either. Gun shows are an exception here, but all the dealers I've seen at them still do the "NICCS", which is an instant criminal background check created for gun sales. Closing the "gun show loophole" is one of the things talked about, too, but again, I think that also fits into this racialized, "criminality" narrative. i was thinking that gun shops may need to get a permit or something like alcohol sellers here do, so the state would have control of where they could set up. Something I've been wondering about is about whether or not gun law enforcement is weighted against people of color. I can't find any statistics at all of the racial make-up arrests and sentencing for gun possession crimes, but I would be pretty surprised if they weren't higher for people of color.